Verto Supreme is a fully-managed IP telephony system hosted in the cloud. It works with Vox Chrome Air (LTE), Vox ADSL services or any form of Vox uncontended last mile connectivity, such as, fibre, diginet and microwave. Reduced user fee and no SLA fees for a limited time only! Below are just a few of the many included features. Reduced call rates – Our packages start from 0.25c excl. VAT – much lower than the average 0.50c other Telcos are charging. Just pay less, it’s that simple. Basic call recording – Keep a record of all your calls for up to 30 days. Just in case the customer is not the king. Conference calling – Conduct meetings with colleagues and clients nationwide and around the world – without worrying about what you’re wearing. Never miss a beat or detail with the clarity of HD voice – using a wideband audio frequency and double the audio samples per second. Take comfort and security in our provision of excellent service, with an inclusive service level agreement. PBX hosted in the cloud means flexibility for access, swift implementation, as well as off-site management and storage. Vox has done excessive interoperability testing to ensure Verto Supreme works optimally with the handsets we deploy; our supported brands are Yealink, Polycom, Gigaset DECT and iServ DECT. For no additional charge turn your office into a virtual office when the power goes down by having voice calling apps installed on your employees’ mobile phones. For an additional R5 excl. VAT, get reporting insights to understand your usage and get the right insights to cut your call costs. Information is power. A Hosted PBX (Private Branch Exchange) is a telephony solution delivered as a hosted service where the PBX infrastructure is hosted in the service providers Cloud / network. What are the benefits of going with a hosted PBX solution? Save on initial and ongoing costs; eliminate office boundaries as employees can work from anywhere; by using a hosted PBX, small businesses can give the impression of being a large organisation with a professional phone system; perfect for multiple sites where centralised and seamless operations are required and hosted PBX’s are scalable which allows your company to add lines or extensions without the worry that you will outgrow your PBX. Can I use any SIP device with Verto Supreme? No. Vox has spent an enormous amount of time ensuring that the handsets we connect to Verto Supreme work seamlessly with the platform and that we are able to auto provisioning the handsets which in turn allows us to manage the handsets that are deployed – this includes changes to the handset configurations, managing firmware and bug fixes and generally supporting the solution without the need to send someone to site all the time – which is a key feature of a hosted PBX solution. 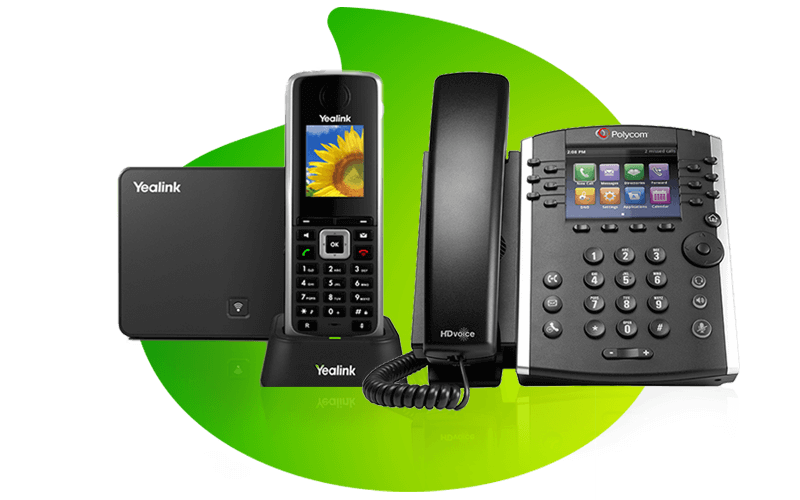 Therefore, Vox only supports Yealink, Polycom, Siemens Gigaset DECT, iServ DECT handsets and Vobi (Vox softphone application). Is there a softphone application that I can use with Verto Supreme for my mobile users? Yes. Vox’s Vobi is an approved softphone client that is compatible with Verto Supreme. Will I have access to Verto Supreme to manage my extension or site? Yes. Verto Supreme has both a user and administrator portal accessible via the web where features and functions of Verto Supreme can be managed. I have multiple sites across the country; can we dial between sites using extension numbers and can the receptionist see if users at another site are busy? Yes. This is possible and is one of the key benefits of Verto Supreme. Does Verto Supreme provide any contact centre functionality? No. Verto Supreme provides basic telephony functionality with no contact centre ability. One of our on-site PBX solutions will better suite your requirement. Does Verto Supreme support voice recording and if so, how long are the recordings stored for? Do I pay extra for voice recording? Yes. Verto Supreme supports basic voice recording and is provided at no extra charge. The recordings are stored on the Verto Supreme platform for a period of 60 days, whereafter the customer would need to log into the Verto Supreme admin portal to download them individually then save them. Note that the Verto Supreme recording option is not designed for compliancy purposes. Will there be a call cost between my sites that are all contracted for Verto Supreme? No. Calls between registered Verto Supreme sites under the same customer will not be charged for inter-branch calls.